The idea that investors and lenders may take additional risks in a ‘reach for yield’ is not new in academic circles. Cox (1967) points out that one of the reasons that motivated the regulation of interest rates on bank deposits in the 1930s was to prevent banks from ‘reaching for yield’ to cover the additional costs generated by any excessive remuneration of deposits. The concept has achieved prominence in financial market debates in recent years, coinciding with a period of low and stable interest rates. Indeed, financial market practitioners and policy makers generally refer to ‘search for yield’ as the tendency of investors to take on higher risk in exchange for higher expected returns when interest rates are low (as for example in Rajan, 2005). ‘Search for yield’ is often analysed in the context of fixed income securities, where investors can be observed moving from safer bonds to higher yielding, riskier securities when interest rates are low. That said, consistent with the increasing sophistication of finance, a ‘search for yield’ can materialise across a large spectrum of investment and lending decisions, involving both price and non-price aspects of financial transactions. In the early 2000s, a compression in risk premia on vanilla securities was accompanied by the development of ever more complex instruments, promising higher returns for incremental amounts of risk that were somewhat opaque and not always fully appreciated by investors. In recent years, against the backdrop of very low interest rates and quantitative easing, a tendency has developed among investors to accept higher duration, credit and liquidity risk in order to boost returns. This contributed to a compression in risk premia in a number of asset classes and stronger issuance of loans with fewer covenants, although risk premia have not fallen homogeneously (Figures 1 and 2). Source: BofA Merrill Lynch Global Research and author calculations. Source: Dealogic and author calculations. Issuance figures are based on the domicile of the deal. The efficient market hypothesis assumes that asset prices correctly reflect all available information, in line with the economics literature that sees the individual as a rational and utility maximising agent. Although this assumption is at the basis of the traditional finance literature, it was challenged over the years by empirical evidence on the price formation and volatility of both individual assets and broader asset classes. Behavioural finance provides a contrasting interpretation of market functioning, where decision-makers are not fully rational, and prices can deviate from their fundamental values for long periods of time. This includes the ‘limits to arbitrage’ literature which argues that asset mispricing can persist in a market where rational and irrational traders interact, as strategies that would correct the mispricing may be unattractive due to the risks and costs involved (Barberis and Thaler, 2003). Insights from cognitive psychology are used to model market agents and highlight the systematic biases that emerge in people’s preferences and beliefs. The phenomenon of ‘search for yield’ displays features that make it an interesting manifestation of the interaction between rational and behavioural factors in financial markets. Not only does the extent ‘search for yield’ in the financial system matter, but also its nature, from both a financial stability and real economy perspective. Reallocation of investment portfolios towards riskier assets on the back of low interest rates and quantitative easing is a key transmission channel of monetary policy. Thus, stronger risk taking can reflect changing underlying economic and financial conditions and be an intended consequence of a monetary policy stance aiming at strengthening growth and warding off downward inflation risks. On the other hand, a tendency to ‘search for yield’ in financial markets can become a reason for concern, particularly when it is perceived to become excessive and lead to under-pricing of risk. Part of the problem derives from the difficulty in measuring the extent to which ‘search of yield’ leads to an under-pricing of risk and asset price misalignments, due to uncertainty about the ‘fair value’ of underlying assets. More broadly, elevated exposures and correlated positions could amplify market moves in the event of a shock that triggers a correction. As investors rush to unwind their positions, this could lead to abrupt and disorderly price adjustments, particularly when ‘search for yield’ is combined with leverage, maturity mis-matches and/or poor market liquidity. Meanwhile, to the extent that it causes investors to overlook fundamentals in their asset allocation decisions, ‘search for yield’ could lead to a misallocation of resources. This could for example mean that underperforming firms continue to receive financing. Behavioural biases can amplify an initial mis-pricing of risk caused by investors engaging in ‘search for yield’. Notably, ‘herd behaviour’ can lead risk-takers to imitate other investors, possibly due to reputation or compensation concerns; investors may feel compelled to chase a higher yield to keep up with their competitors. ‘Myopia’ can lead investors to overreact to short term price fluctuations; investors may join in a ‘search for yield’ as a result of an excessive focus on short-term developments. The use of rules of thumb­ – or ‘heuristics’- can lead to erroneous inferences on ‘fair value’; for complex securities, valuation errors can be related to a lack of complete data-sets or to models being misspecified. That said, even when risk taking appears to go beyond a rational analysis of economic fundamentals, it is not always the result of an incorrect assessment of underlying risks. Indeed, ‘search for yield’ can be triggered by arguably ‘rational’ responses to constraints and incentives independent of the pure asset valuation process. The ‘search for yield’ environment of the last few years provides two sets of examples of these motivations. First, a mix of business and regulatory constraints and incentives, for example differing capital charges across asset classes, influence investment decisions. Evidence of this can be found in institutions where a combination of narrow investment mandates, the business model and regulatory requirements favour a focus on fixed income assets. 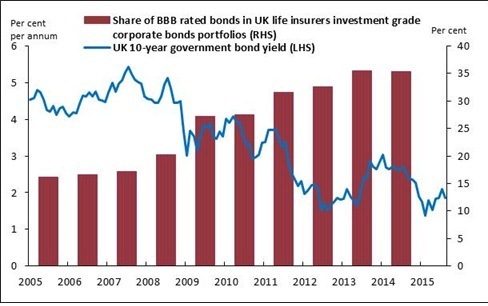 For example, UK life insurers’ holdings of the lowest level of investment grade, BBB/Baa, fixed interest securities, has risen from 17% of all investment grade corporate bonds in 2007 to 35% in 2014 (Figure 3). 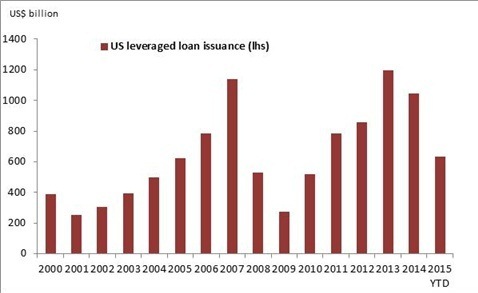 At least in part, this reflects falling average credit quality due to downgrades, as insurers opted to retain downgraded securities, particularly in 2009. But it probably also reflects some ‘search for yield’. 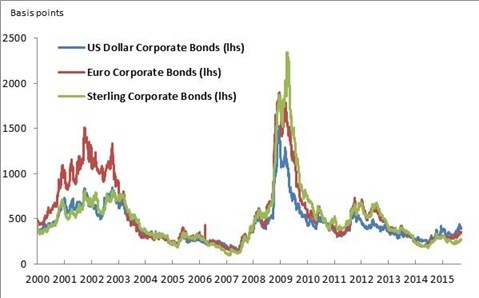 On a similar note, Becker and Ivashina, 2015 show that US insurance companies ‘search for yield’ when allocating investments across bond markets, particularly during economic expansions: while on balance they prefer higher rated bonds (as this reduces capital requirements), they opt for the higher yielding bonds within each credit rating category (capital requirements do not vary within each rating bucket). Source: FSA regulatory reports, Bank of England and author calculations. Second, institutional investors are often judged on the basis of nominal returns targets or required to track benchmarks. Indeed, interest rates at historically low levels for an extended period of time can lead investors with nominal return targets – including some life insurance companies, pension funds, and money market funds – to take on more risk, through adjusting asset portfolios or balance sheet leverage. For example, insurance companies in a number of continental European countries have issued a substantial share of long-term investment products with guaranteed returns, often not matched by assets of similar duration (as described for example in EIOPA, 2014). These promised returns can be well above the currently prevailing long term interest rates: for example, in Germany life insurers have an average guaranteed rate of return on current policies of 3.1% (Standard and Poor’s, 2014 as reported in Bank of England, 2015), much higher than current government bond yields. These balance sheet pressures are likely to act as powerful incentives to take on more risk. Overall, the experience of the past decade shows that a tendency to ‘search for yield’ on the back of low interest rates can be motivated by a mix of ‘rational’ and ‘behavioural’ factors and that the relative importance of those factors can vary over time. Going forward, a deeper understanding of those drivers could usefully inform efforts to gauge the financial stability risks associated with higher risk taking in financial markets and its possible reversal. Silvia Pepino works in the Bank’s Capital Markets Division. Previous Post Why has world trade been so weak in recent years? Next Post High-frequency trading and market quality: What’s the deal?